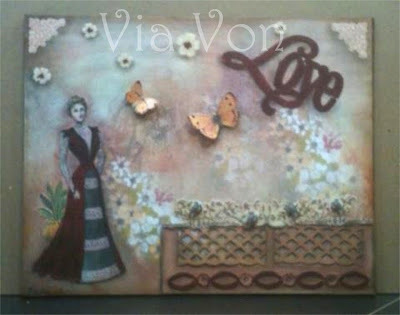 In complement of colour and style to the "Best of Everything" design shared in my posting of August 27th, I did another 8x10 canvas board design - "Love Thoughts"
This was done with a combination of acrylic paints, watercolours, distress inks, Spectrum Noir, Prismacolour pencils, paper punch, store embellishments/die cuts. The lady image is from The Graphic Fairy and background image is from Astrid's Artistic Efforts (those image resource links are also linked in my Fave's, to the right). Wow, Von! You have combined great elements to choreograph this vintage scene! That Graphic Fairy image is just gorgeous and I love where you have placed her! You have so creatively combined color--from paint to watercolor to inks! Bravo, my friend, bravo!